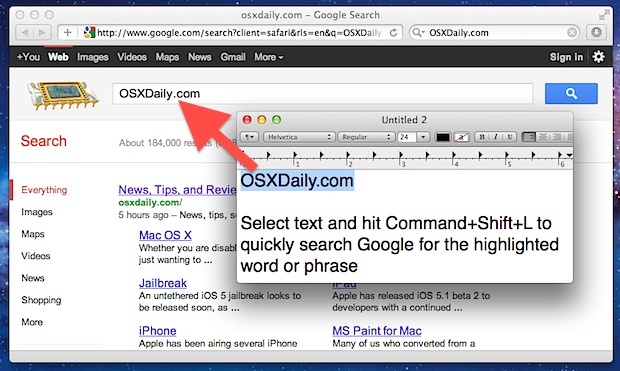 Mac OS X and many default apps have a built-in ability to quickly search the web. To quickly search the web, just highlight any text in the Finder, Preview, or TextEdit, and then hit Command+Shift+L to launch Safari with a Google search for the highlighted text selection. The web browser will be set to Safari regardless of your default browser settings and doesn’t appear to be customizable. You can also access the “Search for” option from right-click menus throughout OS X. Other apps beyond the three mentioned likely have the same ability, but the Command+Shift+L keyboard shortcut in Safari opens Reading List rather than searching the web. For those who have done their best to move away from Safari should check out this post. This will use your default browser. @Tom, your tip is appreciated, but the info on that page in your posted link doesn’t seem to work.